229 Commonwealth is located on the north side of Commonwealth, between Exeter and Fairfield, with 227 Commonwealth to the east and 231 Commonwealth to the west. 229 Commonwealth was designed by Peabody and Stearns, architects, and built in 1882 by Hezekiah McLaughlin, mason, and Morton & Chesley, carpenters. As originally built, 229 Commonwealth had an elaborate balustraded parapet (removed sometime prior to the 1940s). 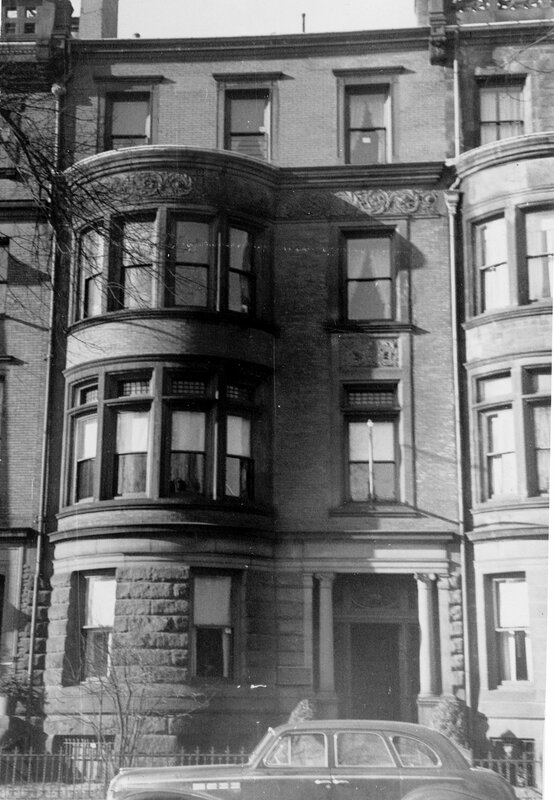 Soon after 229 Commonwealth was completed, Peabody and Stearns designed two additional houses, to the east at 225-227 Commonwealth, in the same basic design as 229 Commonwealth, with a three story bow on the west side, a rusticated stone façade on the basement and first story levels, and a heavy parapet at the roof. The three houses were distinguished by the use of different materials and different details for the entrance, fenestration, and parapet, variations on the same theme. 229 Commonwealth was built as the home of Dr. Francis Peleg Sprague, an ophthalmologist, and his wife, Elizabeth Rebecca (Lowell) Sprague. They previously had lived at 9 Chestnut. He is shown as the owner of 229 Commonwealth on the original building permit application, dated May 12, 1882. The land for 229 Commonwealth was purchased from the Commonwealth of Massachusetts on May 2, 1882, by a trust established under the will of Elizabeth (Lowell) Sprague’s father, John Amory Lowell. On October 22, 1884, the trust transferred the land and completed dwelling house into Elizabeth Sprague’s name. Click here for an index to the deeds for 229 Commonwealth. Elizabeth Sprague died in June of 1904. The Spragues had no children and she left her property, including 229 Commonwealth, in trust for the benefit of Francis Peleg Sprague during his lifetime, with the proceeds to be distributed thereafter to the children of her brothers and sisters. She named her nephew, Herbert Lyman, as executor; he was the son of Arthur Theodore Lyman and Ella (Ellen) Bancroft (Lowell) Lyman. Francis Sprague continued to live at 229 Commonwealth, joined by his first cousin, Miss Lucy Sprague Sampson. She was the daughter of William Henry Sampson and Sarah (Sprague) Sampson, Francis Peleg Sprague’s aunt. Lucy Sampson previously had lived at 127 Commonwealth with Sarah (Weld) Pratt, the widow of George Pratt. 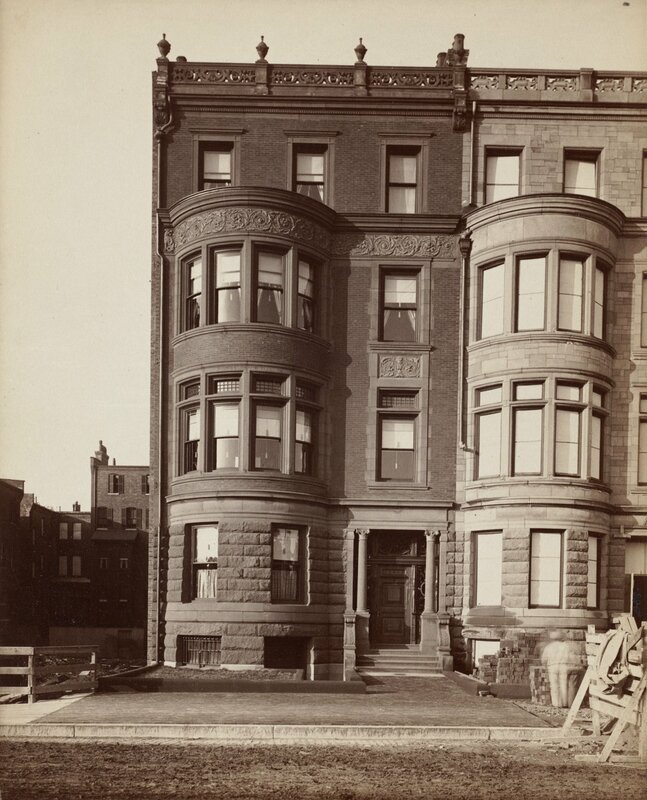 Mrs. Pratt had died in June of 1902, after which Lucy Sampson lived briefly at the Hotel Berkeley (southeast corner of Berkeley and Boylston). Francis Sprague and Lucy Sampson continued to live at 229 Commonwealth until his death in October of 1921. 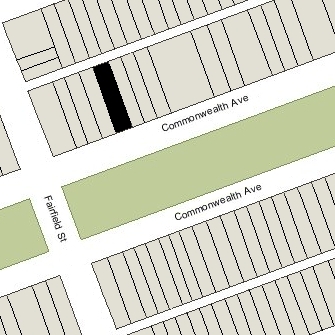 229 Commonwealth was not listed in the 1922 Blue Book. On May 11, 1922, 229 Commonwealth was acquired from the trust established by Elizabeth Sprague and from her heirs by her nephew (and executor), Herbert Lyman. He and his wife, Ruth Bowman (Whitney) Lyman, made it their home. They previously had lived 26 Marlborough. Herbert Lyman was treasurer of the Merrimack Manufacturing Company, owners of cotton mills in Lowell and in Huntsville, Alabama. His brother, Arthur, was president of the company. Ruth Lyman was active in social work and municipal reform, and a vocal opponent of women’s suffrage. The Lymans continued to live at 229 Commonwealth in 1935. They also maintained homes in Readville and in Northeast Harbor, Maine. In mid-1935, the Lymans moved to their Milton home and leased 229 Commonwealth to Chamberlayne School, which opened its facilities there in August of 1935. It previously had been located at 178 Commonwealth. In February of 1936, Herbert Lyman applied for (and subsequently received) permission to convert the property from a single-family dwelling into a private school. Chamberlayne School continued to be located there until about 1942, when it relocated to 112 Beacon . Herbert Lyman died in June of 1941. In July of 1942, Ruth Lyman, still a resident of Milton, donated the iron fence in front of 229 Commonwealth to the government’s wartime scrap iron drive. In a July 25, 1942, Boston Globe article she urged her neighbors to follow suit, saying “Let the railings go to Uncle Sam. If other owners of grass-plot railings care to follow suit I will gladly arrange for their collection.” A November 22, 1942, article in the Globe noted that hundreds of Bostonians, many in the Back Bay, also donated their fencing and ironwork. On October 29, 1943, 229 Commonwealth was purchased from Ruth Lyman by real estate dealer Ray C. Johnson. 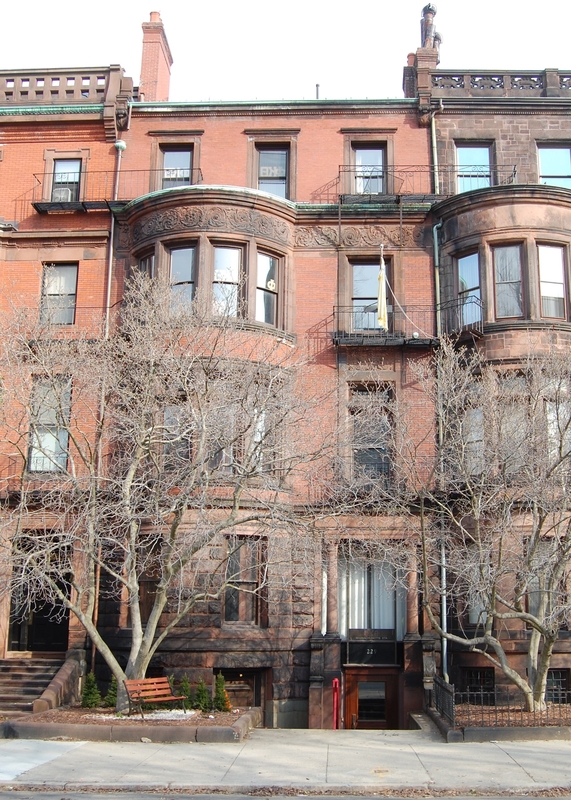 229 Commonwealth was leased from Ray C. Johnson by the MIT chapter of Phi Kappa fraternity. It previously had been located at 312 Beacon. In July of 1944, Ray Johnson filed for permission to convert the property from a school into a fraternity clubhouse and dormitory. He subsequently abandoned the application. In December of 1945, Phi Kappa filed a similar application, which it also abandoned. On September 12, 1949, the Eta Chapter of Phi Kappa Alumni Association acquired 229 Commonwealth from Ray Johnson. In December of 1949, it filed for (and subsequently received) permission to convert the property from a school to a fraternity clubhouse and dormitory. In April of 1959, Phi Kappa fraternity and Theta Kappa Phi fraternity merged nationally to form Phi Kappa Theta. In January of 1966, Phi Kappa Theta filed for (and subsequently received) permission to lower the front entrance of the building from the first floor to street level, and to do associated interior remodeling. 229 Commonwealth remained the Phi Kappa Theta fraternity house in 2016.